Whether you connect them (as shown above) or use them alone, Multiplex Display and Exhibit Panels give you plenty of room to work with on both the front and back. These panels feature self-healing vinyl tackboard that lets you post materials using push pins, thumbtacks or staples. Sturdy tubular frames have a baked enamel finish. 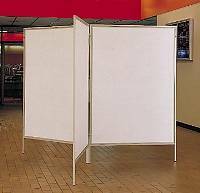 Sold as single panels, our beige vinyl tackboard model comes with beige steel framework, plus connecting hardware; however, be sure to order display feet (sold in the Display and Exhibit Panel Accessories Section) if you plan to use the panels individually.